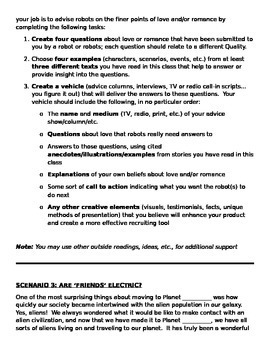 Within a creative scenario (students are helping to colonize another planet), students must synthesize literature, original questions, and creative thinking to demonstrate their understanding and ability to apply core skills to literature. 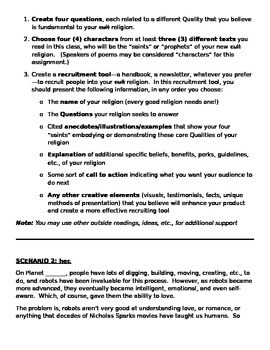 This project can be modified to fit a variety of courses and themes, and the rubric provided allows for flexibility of instructor preference, as well as student responses. Project works best after students have read a number of short stories, poems, or other short creative texts, as it requires students to draw evidence from at least three creative texts. (Obviously, you may adapt project as necessary.) 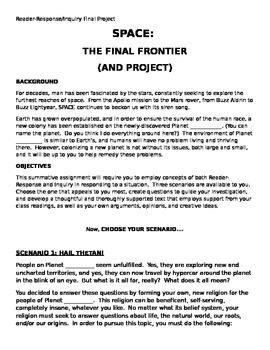 Students could also find their own readings to apply to this project. Earth has grown overpopulated, and in order to ensure the survival of the human race, a new colony has been established on the newly-discovered Planet ____________. (You can name the planet. Do you think I do everything around here?) The environment of Planet __________ is similar to Earth’s, and humans will have no problem living and thriving there. However, colonizing a new planet is not without its issues, both large and small, and it will be up to you to help remedy these problems. 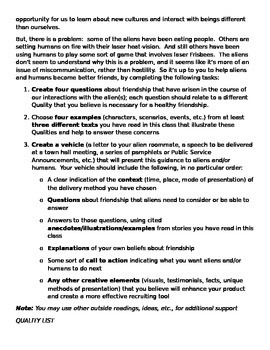 TASK (adapted from assignment): This summative project requires students to employ concepts of both Reader-Response and Inquiry in responding to a situation. Three scenarios are available to you. Choose the one that appeals to you most, create questions to guide your investigation, and develop a thoughtful and thoroughly supported text that employs support from your class readings, as well as your own arguments, opinions, and creative ideas. Document includes background information, extensive details on each scenario and its requirements, list of thematic qualities (for use as central concepts of student projects) and grading rubric.